Take the mushrrom & Trim the stem off , leave it whole. Mix corn flour,plain flour,ginger garlic paste, chilli powder , salt & water to make a thick batter. 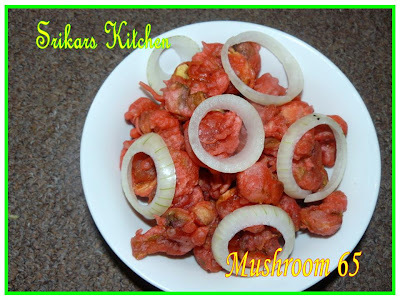 Dip the mushroom in the batter, deep fry in oil. Serve hot with a lemon wedge. Wow! Never would have thought of it. BEcoz I used to think mushroom has so much water content, and frying would have never occured to me. Nice one. Agree with Laavanya this will make an excellent appetizer...looks delicious...how do you get such a pretty color ? I am not a great fan of mushrooms, but your plate of mushroom 65 looks delicious. Have a great weekend. never heard of this dish.. looks great!